A historic start to the week it was for the Roadrunners, who defeated the San Diego Gulls for the first-ever time on home ice, knocking off their Pacific Division foe in a 5-0 shutout victory Wednesday night at Tucson Arena. The team then split a weekend set against the Stockton Heat, winning by a 3-2 score on Friday evening, and falling 4-2 on Saturday. They finished the week with a 2-1-0-0 mark. Adin Hill recorded his third-career shutout in a 29-save performance Wednesday, his second of the season, which is tied for the most among AHL goaltenders. Hunter Miska improved his record to 6-0-0 Friday night in stopping 22 of the 24 shots he faced against Stockton. His six wins are tied for the most among rookie goaltenders. Kyle Capobianco registered assists in all three games, totaling four, and is tied for the lead in points among rookie defensemen (12), and first in assists (11). Nick Merkley registered multi-point performances in all three of the team’s games during the week, totaling seven (3G, 4A). Merkley, with game-winning goals on both Wednesday and Friday night, leads the entire league in that department with four on the season. 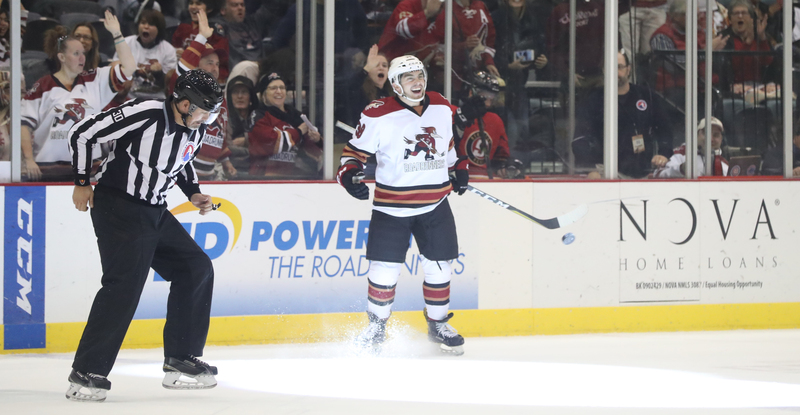 He is currently fifth in the AHL in scoring (21 PTS), and tied for second in goals scored (11). With eight points (4G, 4A) during the week, including tying a franchise-best four-point performance Wednesday night, Dylan Strome was named the AHL’s CCM Player of the Week – the second time he’s received the honor this season. With eight points in three games and a call up to the @ArizonaCoyotes, Dylan Strome (@stromer19) is our @CCMHockey and AHL Player of the Week for the second time this season. Brendan Perlini scored in all four games for the Coyotes during the week, upping his total to eight on the season, which is good for second-most on Arizona’s roster. Christian Fischer netted the overtime game-winning goal for the Coyotes in the club’s 3-2 victory over the Los Angeles Kings Friday night at Gila River Arena. Fischer finished the evening with two points (1G, 1A). Marek Langhamer stepped in for relief of Scott Wedgewood Saturday night in the Coyotes’ 4-2 loss to the Vegas Golden Knights at Gila River Arena, stopping all 10 shots he faced. 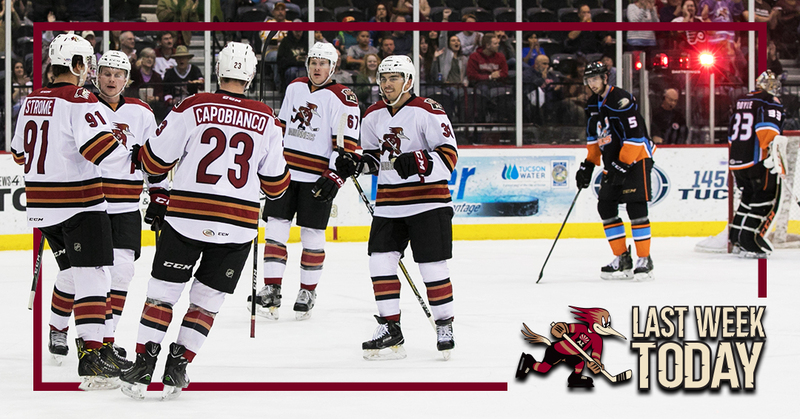 Dylan Strome, streaking through the neutral zone, receives a stretch pass from Kyle Capobianco and walks in alone on San Diego’s Kevin Boyle, beating him with a backhand through the five-hole to give the Roadrunners a 4-0 lead Friday night. “Good teams don’t lose at home, we always say that.” – Michael Bunting, after the team improved to 7-1-1-0 on home ice Friday night. Nick Merkley, alone for a moment, begins the celebration on what was his eventual game-winning goal scored with 7:49 left to play in regulation Friday night. (Credit: Chris Hook).